Hello everyone, and Happy Holidays to you as well as your family. I hope you all are well, and are enjoying the holidays however you normally do. It’s this time of year where one of fantasy’s famous tribes (and my personal favorite) seem to come to life, and while many think they make toys for all of us they actually do a little more than that. Today we will be talking about Elves. Now as many of you know I didn’t start playing at the FNM level until late summer of 2006. Time Spiral was about to come out, and I was getting back into Magic after my daughter (then 10 years old) asked me to teach her how to play. I had (foolishly) sold all of my cards a year or so prior, and had to start over from scratch. While we both started playing weekly after Time Spiral, and it’s accompanying sets Planar Chaos as well as Future Sight came out it was the Lorwyn block that provided some of our earliest (and most memorable) memories into this journey. We both attended the Lorwyn pre-release in Columbus, Ohio in the fall of 2007. It was a sealed event, Steve Prescott was in attendance (the first artist I got an autograph for), and the pre-constructed decks were available for purchase. We were both paired against each other in the 4th round of the event, and after we dropped we both signed up for the pre-constructed deck battle. This was the highlight of the event, and also my first time with Dragonshield sleeves (she chose pink for hers, and I think I chose green or black but I can’t remember). We sat down to do battle, and it was probably the most focused we had been playing the game since we started. These decks did not feel like just any old deck. We both made conscious decisions to choose these. They felt like they were ours, and we wanted to be the best with them. It was a blast, and a moment I wish I did more often with her when she was young (she’s 22 now, and taking her first steps into “adulting” as it’s called). While Faeries was the premier tribe at that point (I predicted that all it needed was one more card to go over the top, and boom here comes Bitterblossom) Elves was my first love. I was always a fan of black & green decks so I was naturally drawn to the Elf deck. During that time I had Solar Flare, Dimir Control, Dredge (which I kept to eventually turn into Legacy Dredge), and Angelfie, among others. When the Ravnica block rotated out of Standard I needed a deck to keep playing, and Elves was that ticket. Elves has always been a solid archetype through the years so let’s take a look at how things have evolved. All tribal, all the time. Elves, and “Elf matters” cards were beneficial for staying on tempo with this midrange-aggro deck. You go wide, deplete their hand, and remove any blockers that needed removed. Among some of the other cards were these from this era. These were just some of the key spells that helped power the Elf decks to victory. Lorwyn was a powerful block, and in the top 5 of my favorite blocks of all time. Most of the cards for this strategy (if not all of them) came from this block during this era. With as mana efficient the threats are this provided the resources to cast these cards (or activate Mutavault, which is an Elf when active), and power you to victory. While Shards of Alara provided a few cards (namely Maelstrom Pulse) to help vs Faeries, and other difficult matchups, it wasn’t until we had a Standard of Zendikar plus Scars of Mirrodin blocks when Elves became another powerful strategy. Being able to sacrifice Nissa’s Chosen to Eldrazi Monument, only to get it back again from Nissa Revane’s first ability, left you in tempo once your the monument was online. In the days before Supreme Verdict having a flying indestructible army was very great against many decks (until Caw Blade took over the meta). Ezuri helps your go wide strategy get through opposing blocks, and helps if Eldrazi Monument is removed. Joraga helps pump your team, which may be enough in itself, and if you are flooded on land Lead the Stampede helps fill your hand. A lot of these cards are still at home with Elf players to this day. Since Scars of Mirrodin rotated out Elves were not much of a tribe, with the exception of the brief period where Theros block; Magic 2015; Khans of Tarkir block; and Magic Origins were all in Standard. Since those days many cards have been made available to push Elves to be a power within Modern. Shaman of the Pack, and Collected Company, were two cards that really gave this deck some velocity as well as an alternate way of winning. With these two cards, and a field of Elves, one could easily do 20 (or more) points of damage with 2 Shaman triggers. The difficult part though is keeping your team a live long enough for that to happen. In an age where Path to Exile, Lightning Bolt, and Fatal Push are key cards in the meta (and often times in the same deck) it’s hard to keep 1/1s, 2/2s, and 3/3s on the board. There are ways to combat the loss of your creatures in the main deck, and more tools in the board to help. 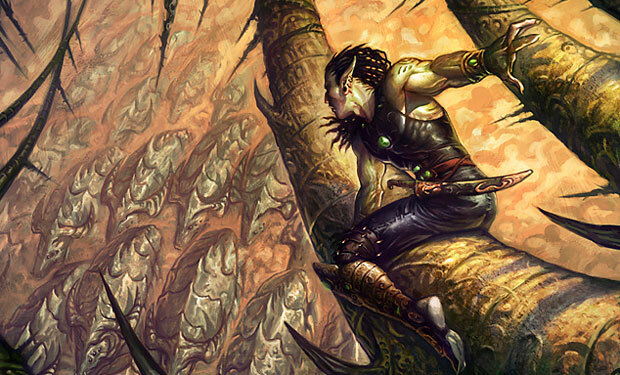 Let’s take a look at a Modern Golgari Elves deck. I know most decks splash white for some sideboard cards, however I want to keep the manabase as simple as possible. Having some silver bullets in the board to fetch with Chord of Calling also helps a lot. While I have not played this deck a lot having Leyline of Vitality in the deck can help against some decks, and keep your life total high enough to give you an extra turn or two. It’s also free to play before your first turn, and has to have dedicated enchantment hate to get rid of it. Simply put you like to go wide, and attack as often as possible. You like a deck that is full of synergy. You want to play a linear deck that still has a lot of lines to explore. Why do you not want to play Elves? The deck is too linear for you. Your meta is full of spot removal. You are not an aggro player. This tribe has a lot to offer to the casual fan, and even competitive players. For one of the most iconic tribes in the 25 years of Magic’s history it has evolved many times, and is still a viable strategy to this day. To be able to have an archetype that (literally) has something for everyone is definitely a positive thing in this game, and is also a good starting point for your friend who isn’t playing yet, but may be interested. Well that’s it for this special Holiday edition of the blog. What are your thoughts on this archetype? Do you have any memories of playing Elves? Share them below, and make sure to follow me on both Twitter as well as Facebook. Until next time…TAP MORE MANA!! !